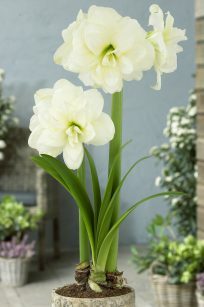 ‘Alfresco’ is perfection personified in the form of a fully double white Amaryllis. Stout, sturdy stems grow amidst foliage that often develops simultaneously with the flowers. Flowers with chartreuse-green throats that fade to snowy white petals sometimes blossom with triple layers. 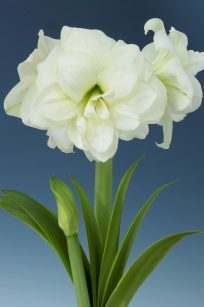 As beautiful as glistening, freshly-fallen snow, they are excellent in vases and cut flower arrangements. 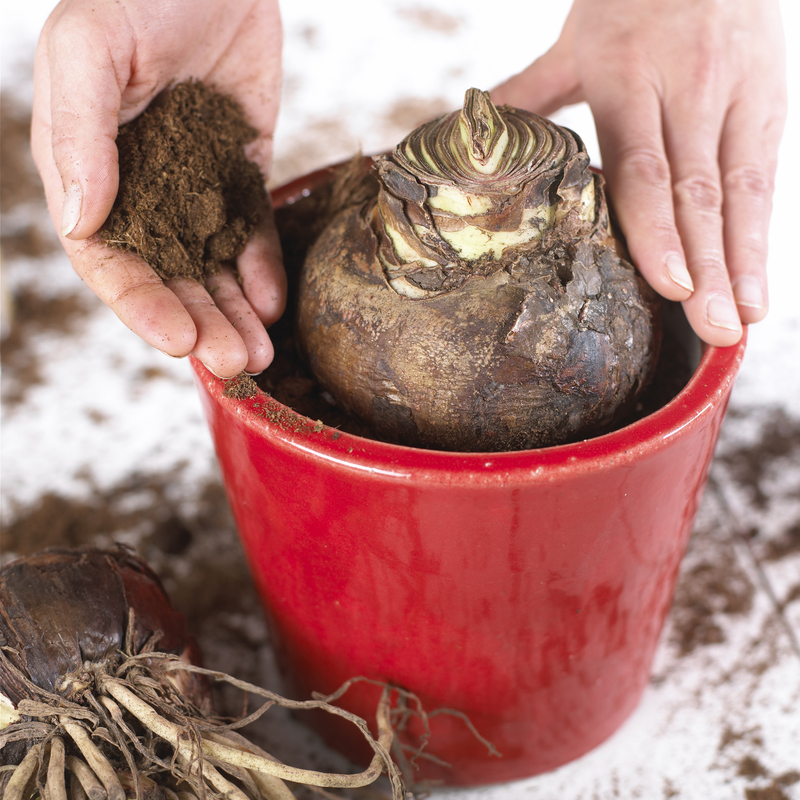 Easy to plant and grow. Long-lasting, colorful flowers. 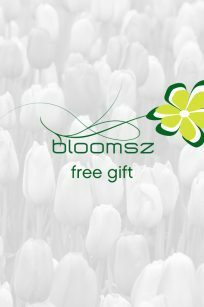 Flower stems can be cut and placed in water when buds begin to change color. For longest-lasting blooms, keep plant away from heat and direct sunlight. 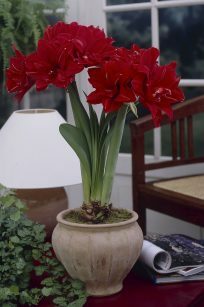 Amaryllis ‘Red Peacock’ is as proud of its flowers as a peacock is of its colorful plumage. 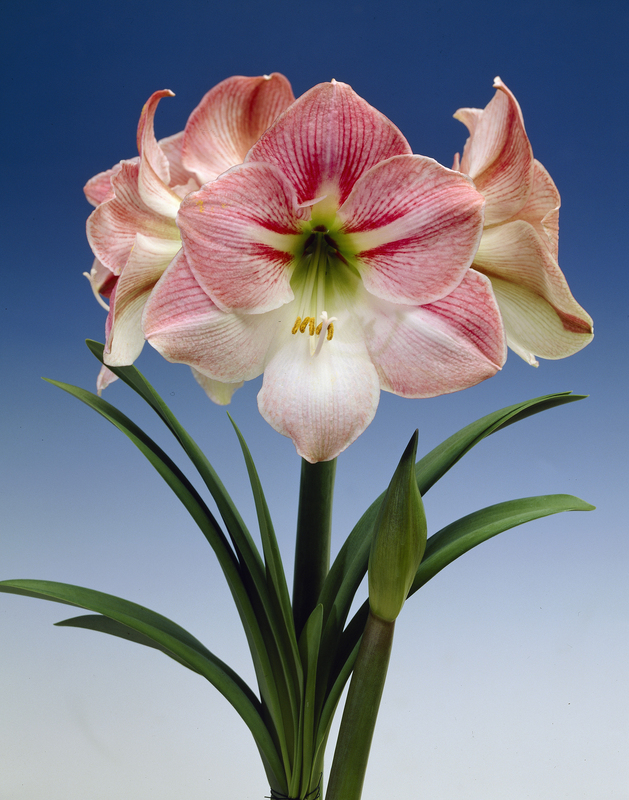 A strong, sturdy stem boasts multiple, fully double rounded blooms. Each bloom bursts forth in a breathtaking display of vibrant red petals occasionally marked with a pencil-thin stripe of white as crisp as white linen. 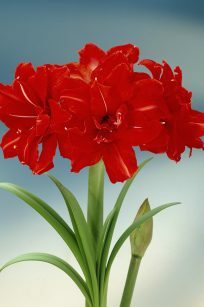 Flamboyant growing in containers, ‘Red Peacock’ dazzles in cut flower arrangements, shines as the focal point in a bouquet, and is magnificent amidst greenery in a low floating flower bulb centerpiece. Easy to plant and grow. Long-lasting, colorful flowers. Flower stems can be cut and placed in water when buds begin to change color. For longest-lasting blooms, keep plant away from heat and direct sunlight. 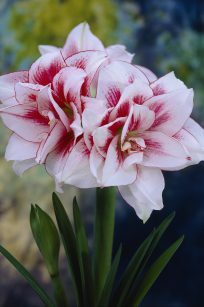 With its strikingly beautiful shape and distinctive coloration, Amaryllis ‘Elvas’ will have everyone wondering if it is real or a very expensive artificial creation. 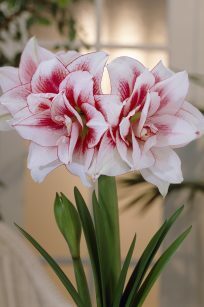 A fully double variety, ‘Elvas’ boasts multiple layers of white petals flushed with red centers and edges daintily outlined in red. Plant it in a pretty decorative pot for a spectacular centerpiece. Cut a stem and place it in a slender vase for a contemporary look, or add it to bouquets and cut flower arrangements. 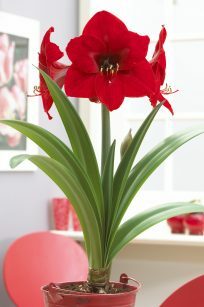 ‘Elvas’ will make a delightful gift for amaryllis-loving friends. 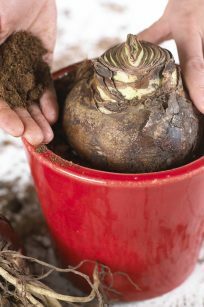 Easy to plant and grow. Long-lasting, colorful flowers. Flower stems can be cut and placed in water when buds begin to change color. For longest-lasting blooms, keep plant away from heat and direct sunlight.